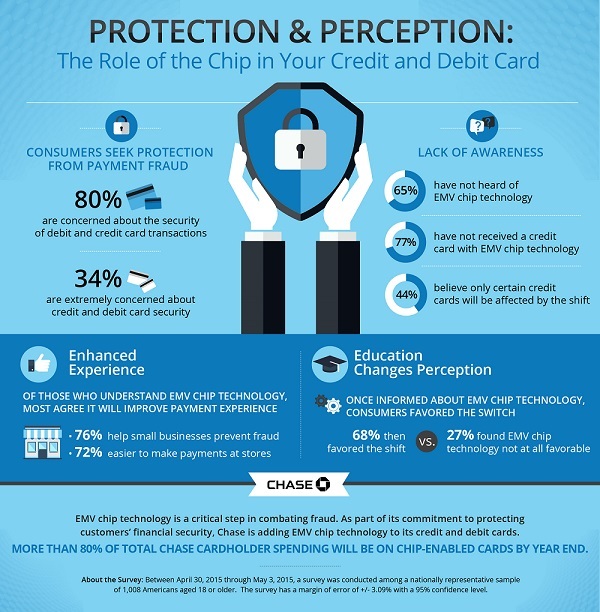 With less than six months to go before the October 2015 EMV liability shift for U.S. payment cards, 65 percent of consumers haven’t yet heard of chip card technology and 77 percent have not received a chip-enabled card, according to a survey JPMorgan Chase released today. The vast majority—80 percent—of respondents said they are concerned about security for debit and credit card transactions, and 44 percent believe only certain credit cards will be affected by the shift, the survey suggests. Once informed about EMV chip card technology, 68 percent of respondents said they favored it, though 27 percent said they found chip-card technology not at all favorable. Chase surveyed 1,008 Americans by phone April 30 through May 3, 2015. The lack of awareness about major changes coming in the next several months underscores an urgent need for consumer education, Chase suggests. Chase is rolling out chip cards to all of its consumer and business customers, including credit, debit and Chase Liquid cards. More than 70 percent of its credit and debit cards will be chip-enabled by the end of 2015, resulting in more than 80 percent of total Chase cardholder spending on chip cards, Chase said. In upcoming months Chase also is upgrading its ATMs nationwide to accept chip cards. Already Chase has 22 million chip-enabled cards in circulation, according to the bank.